A reliable source for Small Vacuum Cleaners information and a resource for accessing leading Small Vacuum Cleaners and suppliers. Small Vacuum Cleaners Small vacuum cleaners are industrial vacuum cleaners that are used for collection of dirt, debris or other waste materials on a small scale. In maintenance and service applications where vacuuming is required, small vacuums may be necessary to reach tight spaces. For large scale operations that produce large amounts of waste material, large industrial vacuums are often required to accommodate them. Central vacuum systems, continuous duty vacuums and other varieties of large vacuums are appropriate in such settings. In settings that produce a small volume of waste materials, large vacuum systems can be inappropriate and unnecessary. Some interior vehicle detailing services, for example, require vacuum systems that are highly portable and feature specialized accessories that make hard-to-reach places accessible to the vacuum. Also, disaster recovery service providers travel to homes and places of business, each with its own unique needs. A small wet dry vacuum is often the only appropriate tool for addressing those needs. The main advantages of small vacuums over large vacuums are their high portability, ease of use and versatility. For all vacuums, small and large, the vacuuming process is made possible by the artificial creation of an air pressure imbalance. A fan or system of fans somewhere within a given vacuum creates an area of negative pressure within the vacuum's collection enclosure. This imbalance causes air to rush in from outside the enclosure, bringing with it whatever solid or liquid materials that get caught in the flow of air. 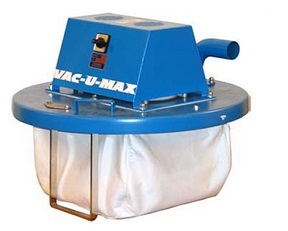 In small vacuums, that enclosure is often lined with a removable filter bag or combination of fabric and a filter bag. Filter bags are usually disposable, but some varieties are washable. Other varieties feature a removable plastic enclosure that can easily be emptied and re-attached to the vacuum. Some varieties of small vacuum cleaners are fitted with casters so that they can be wheeled around a workplace, while others are simply designed with handles. Recent developments in battery technology have allowed for the development of battery operated, portable vacuum cleaners. These allow for unlimited movement while working, but they are usually limited in terms of their maximum suction power compared to non-battery powered models. Also, battery-powered vacuums are not yet practical in applications that demand extended vacuuming because of the current limits of battery technology.